When Amazon.com Inc. agreed to build its second headquarters in Queens, it not only got $3 billion in incentives from New York, but one of the rarest perks in the Big Apple: a helipad. Places to land helicopters have been scarce in New York City ever since a fatal crash 40 years ago on a rooftop helipad. But demand is high. Passengers are willing to pay hundreds of dollars to bypass New York’s congested roadways for helicopter services. “There isn’t gridlock in the sky,” said Rob Wiesenthal, the founder and chief executive of Blade. His company charters or crowdsources seats on helicopter flights from the city’s three commercial heliports. A trip from Manhattan to John F. Kennedy International Airport costs $295 and takes about 10 minutes. By car, the drive can take more than an hour in traffic. During the most heavily congested days on New York’s roads, like the week of the United Nations General Assembly in September, some of his clients have taken helicopters from the East Side of Manhattan to the West Side—a distance of a little over 2 miles—Mr. Wiesenthal said. Associated Aircraft Group, a New York-based charter company, offers fractional ownership, a kind of timeshare for helicopters, as well as corporate charters. The company’s website boasts ”incomparable comfort and luxury” for business travelers using its fleet of Sikorsky S-76 aircraft outfitted with handcrafted wood cabinetry and tailored upholstery. The company charges $3,200, excluding taxes, to charter a helicopter that can seat up to eight people from Manhattan to a New York-area airport. The company also flies to destinations across the Northeast, from Portland, Maine, to Washington, D.C. The commercial use of helipads in New York has been severely limited since a helicopter sitting atop the Pan Am building, now known as the MetLife building, tipped over in 1977, killing five people. Hospitals and emergency services have their own helipads for private landings. But executives flying into Manhattan currently have to make do with public heliports at West 30th Street and East 34th Street. A heliport at Pier 6 near Wall Street is used mostly for tours of the city. A typical twin-engine helicopter favored by executives would pay about $400 to land at one of the sites and about $260 an hour to park there. Securing a helipad didn’t come easily for Amazon. New York City officials pushed back on the demand before agreeing under the condition that the online retailer limit its landings to 120 a year, according to a person familiar with the negotiations. The helipad will be at the waterfront campus that Amazon will build in Long Island City, Queens. Experts said that the roughly 200-mile flight from Amazon’s other new headquarters, in Crystal City, Va., to Long Island City could be as short as one hour and 20 minutes. Depending upon the terms imposed by public officials, Amazon may be able to fly executives in and out whenever it wishes, unlike other pilots who are subject to the whims of the city’s heliport opening hours. The West 30th Street heliport is the only one open 24 hours a day, seven days a week. 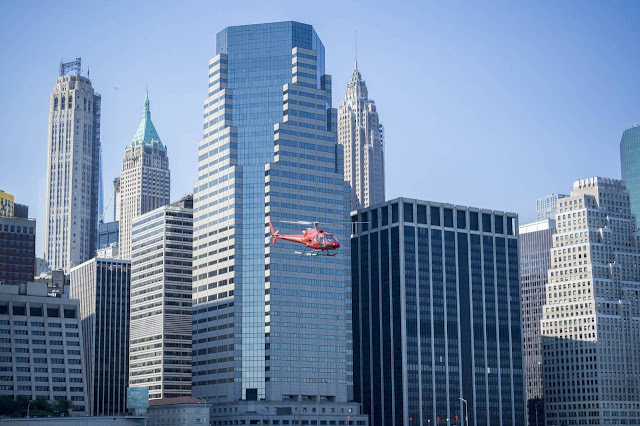 Through August of this year, there were more than 19,000 helicopter flights out of the city’s Wall Street heliport, according to data from the New York City Economic Development Corp., and they were mostly tour flights. The East 34th Street heliport logged more than 5,700 helicopter flights from January through September, the data show. The West Side heliport, owned by the Hudson River Park Trust, recorded 12,000 flights last year, which were all corporate, according to a trust spokesman. Building a helipad isn’t as expensive as it might seem. Ricarda Bennett, of Heliport Consultants, in Los Angeles, said a ground-level heliport can run anywhere from $25,000 to $100,000, depending on whether an owner wants to add fixtures such as lighting or underground heating to melt snow. Federal Aviation Administration officials said Amazon will need its approval to ensure that helicopters can safely operate from the location and that the heliport meets design and construction requirements. Ms. Bennett, who helps companies through the permit process, said the biggest hurdle will likely be opposition from local residents citing noise concerns. Although Amazon’s agreement limits it 120 landings annually, there is already opposition to putting a helipad on the company’s proposed campus. John Dellaportas, a lawyer and president of Stop the Chop, has fought to stop helicopter flights around the city, particularly tour flights. “It seems that Mr. Bezos and his management team struck an incredibly good deal for Amazon and his shareholders,” he said. He added that it was good of the city to restrict flights, but he remains concerned about noise. Mr. Dellaportas lives in Battery Park City, in lower Manhattan, and has tried to stop the noise from choppers near his home. “It’s a constant deafening drone,” he said. —Jimmy Vielkind contributed to this article.